I love turqouise and copper as a combination. These Little Betties are made using hand forged copper rings, copper craftwire and turquoise glass beads. I was so happy to find at Artbeads.com the antique copper earwires, they really complete the look without the worry of patina. Light weight and just great for a jeans and t-shirt day. I made a pair for myself and loved how they look on. I will post them on my Artfire store here. I hope you like them. I enjoyed making them. Love weekend earrings. With the whispers of snow for San Antonio (this is a big thing here..it rarely ever snows here), i have decided to add to a set of earrings and pin that i already own. 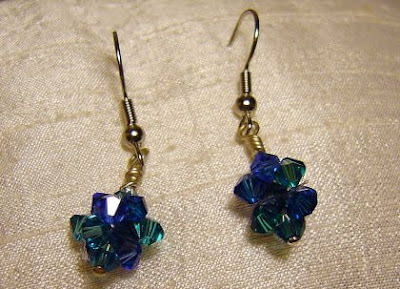 I added a Swarovski flat back crystals to some silver snowflake earrings. You can see the set as i bought it on ebay here. I'd like to add a ribbon to the Snowflake pin in velvet to make it look luxe. We'll see how it turns out. With the holiday season upon us i have decided to make items that are Christmas themed. To that end I thought of something that i would enjoy and that could be done easily. Gift tags were the answer. 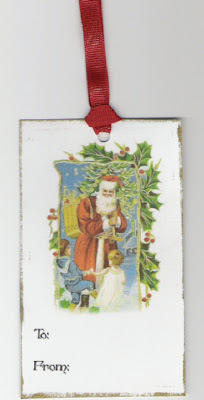 I love vintage Christmas cards and images. Found some Free images and this is what I came up with, a set of three tags with a vintage feel on heavy cardstock. 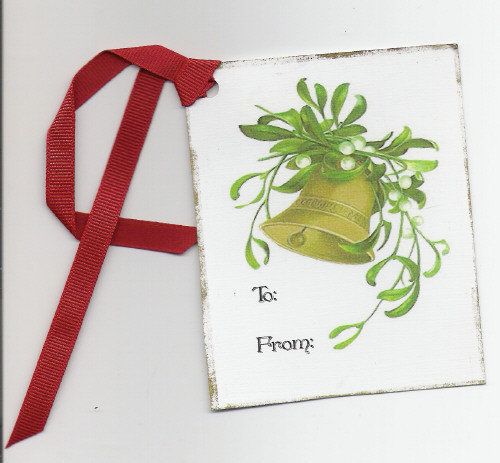 They all have a red grosgrain ribbon about 5" long and they are quite large making them stand out among regular gift tags. I printed them out on Bazzil white card stock. Then proceeded to hank ink the border to give it a worn and antique feel. The ink color was simply called Gold by Stampabilities. The font I found on DaFont.com call Penshurst Shadow. It's a very classic font and I love how it fits in with the vintage cards. I love this one. Bells for Christmas just make me happy and remind me of It's a Wonderful Life. Bells announce the coming or arrival of an event, activity, or occasion. They toll for good times. They toll for bad times. They ring out warnings. Bells herald in the New Year. Bells are rung to announce the union of a man and a woman. They are rung during Christmas to announce the arrival of the season, to proclaim the birth of Christ. Ringing of bells can be traced back to pagan winter celebrations. During those times, noisemakers were used to scare away evil spirits in the night. Among those early noisemakers were bells. People had fun ringing the bells and making noise. It was too much fun to just use bells to scare demons away. So over time, bell ringing was incorporated into other events and activities. Bells are rung at churches to call people to gather, as warnings, and to bring people together to make announcements. From these ancient roots, the ringing of bells began to be used in the Christian Christmas season. The soft, cheerful tones blended well and enhanced the sounds of the season. Today, they play an important, traditional role during the holiday. I love this tag with the mistletoe toe. It's just stunning and timeless. What is Christmas without children. 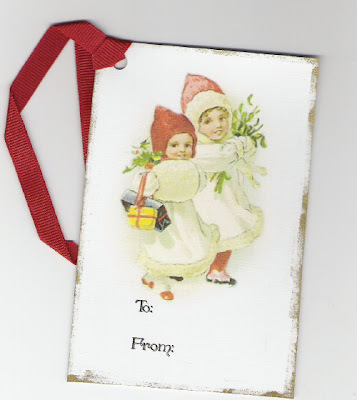 This cherubic pair fit the bill for happy Christmas carolers or children on the way to Grandma's house to celebrate. Bearing holly and misteltoe they are just too cute for words. They are listed as a set in my Artfire store. I hope they make someone's gifts extra special or add great art to a scrapbook page. More to come soon keep checking back. 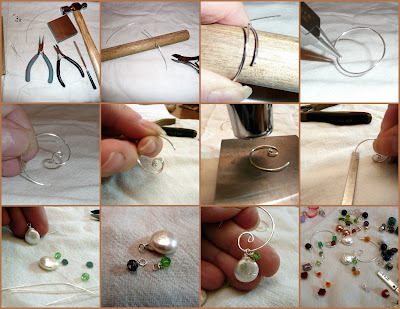 Guest blog writer Dana James of Dana's Jewelry Designs has graciously written a tutorial for her gorgeous Hoop Swirl Charm Earrings. These earrings are the ones I won on her blog giveaway. They are stunning and i know you will enjoy making them! Thanks to Christina for inviting me to do a guest spot on her blog. I wracked my brains trying to think of something original to write about and obviously I couldn’t think of any good article worthy tidbits, but I did have time to write a tutorial for you. I hope you enjoy it. Cut two lengths of wire 3” each. Wrap the wire as shown around the dowel to get the hoop shape. Curl wire on one end under as shown to make a curly cue. Wrap the second wire and curl as you did the first trying to be consistent with the first one you made. Match them up to make sure they look similar. Trim any extra wire on the opposite side of the hoop. Lightly hammer earrings laying them flat on the anvil so that they keep their shape. File rough edges on the open end. Choose 3 sets of beads that coordinate. Thread each bead on a headpin. Make a wrapped loop at the top of each bead with the wire using your round nose pliers. To use, thread one set of beads on one earring hoop making sure that they so not slide off the curl end and repeat with the other. Mix and match other beads if you like. 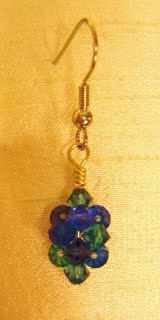 This is a great way to use up some of those left over odd beads from other projects. I am so happy to announce the overhaul of my blog! The New design comes from Anne Meyer of Paint n' Patches. She is out of PA (where I went to undergrad..woohoo!) She is just too cool. Very accommodating and easy to work with (especially with a moody artist like myself who thinks she wants one thing but her heart lies in the complete opposite direction). Right Angle Weave (or RAW) is a wonderful weave. It's name describes it - all the beads are at right angles to each other. There are 2 methods - single needle and double needle. RAW goes fairly quickly once you get the hang of it. If you've ever made a beaded daisy chain you should have little problem adapting. One warning, however, it is addictive!! RAW adapts to many shapes and is a soft weave, feeling almost like fabric in it's flexibility. I found a simply explained pattern for Right Angle weave in the book Beadwork Creates Jewelry : 40 Beaded Designs by Jean Campbell (review to come soon) that i borrowed from the library. It was a pair of beaded earrings called Watermelon Balls and it is just delicate and lovely. Having a ton of 4mm Swarovski crystals, i decided to try it out. I finally had purchased Clear monofilament thread as well. So to work i went. After two hours i had two sets of earrings. It would have been sooner but i lost a bead and had to search forever for it. Delicate cluster earrings that just sparkle. I wish it was sunny today so I could have taken pictures outside to capture all the sparkle. They are just amazing. There is another project ..a cuff bracelet i an aiming to create that i found in a Bead & Button magazine that i so want to make and it's all right angel weave! So can't wait to try it out. here is a video from Jewelrysupply.com that explains the Two needle method of right angle weave. which is what i used. This is so exciting and i am so happy to expand my skills and learn new techniques. I hope you are inspired to try something new and look for jewelry books at your local library and take up a new skill or learn a new technique. Okay, tapping into my Librarian side. It's great to have inspiration all around you, but sometimes a book helps stir the creative forces as well. 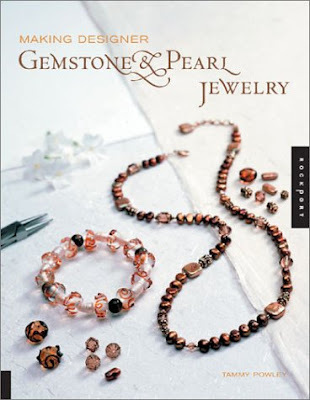 Making Designer Gemstone & Pearl Jewelry by Tammy Powley is one of those book that delivers. Powley takes the reader on a global escapade as she explains the origins and folklore of gemstones and pearls, while providing us with a rich display of beautiful jewelry that is easily re-creatable. Powley also provides the reader with clear materials list and instruction to create the piece. Techniques are bolded and can be referred to in the Bead Basic portion of the book. She also provides the beginner jeweler with the tool of the trade necessary to complete the projects within the book and those beyond. Pictures used in the techniques portion of the book vary from photographs to black and white drawings, all of which are clear and easy to visually comprehend. Throughout the work she provides jeweler's tips to help the practitioner achieve a more professional piece and improve skill level within a technique. I also appreciated the variations on her projects. The variations pieces help to inspire and think outside the box while letting in creativity. For the beginner beader this is essential, as finding your own voice becomes a journey in itself. After 100 pages of beautiful jewelry how-to, there is a gallery of jewelry by artisans. I found this to be particularly interesting and find myself skipping the rest of the book to look at these works more often. They are each stunning and Powley does mention the materials used in each piece. The contact info and a small bio on the artisans is provided so the beader can contact the artisan as many of them teach as well as create jewelry. Finally Powly furnishes us with a list of resources for materials and tools. This is a great list and has many of the suppliers that i use on a regular basis. Her list is not just limited to United States supplies but also includes International sites. I love international sites because they have a different variety of materials and what's hot there is different from what's hot in the US and it's always good to know fashion trends abroad to become inspired and look at a differnt perspective on jewelry. Powley writes for About.com and has been making jewelry since 1989. Her books are often on my library borrow list and I do own a few as well. Overall, this book is amazing to have and refer to often. Her writing style is clear and tips are helpful and the book is inspiring. Great for beaders of any level.